Chevy offers all-wheel drive for $1,500 on all trim levels, so if you're looking for a Subaru competitor at a reasonable price, consider a lower-end model with AWD. The 2015 Chevrolet Trax offers a useful hatchback shape in a smart package that's more practical than it is stylish. The 2015 Chevrolet Trax, along with several other new and smaller SUVs, is jumping into the red-hot utility vehicle market. 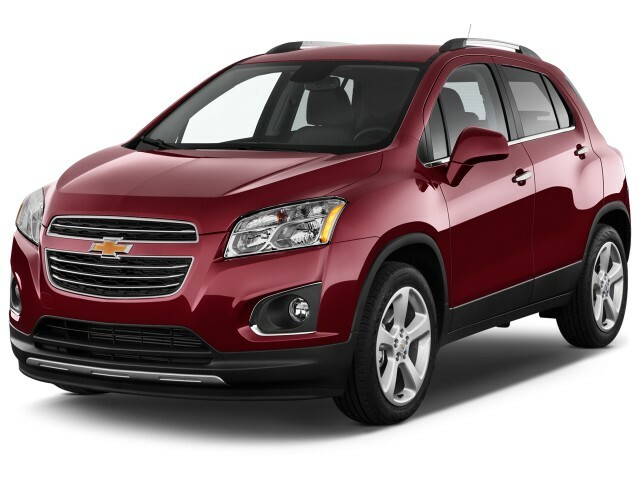 With a lower entry price, the Trax offers most of the amenities of its larger sibling, the compact crossover Equinox. Expanding Chevy's lineup of small cars—from Spark minicar through Cruze compact sedan—the Trax gives the brand its least-expensive all-wheel drive entry. Based on underpinnings shared with the Buick Encore, the Trax is derived from the subcompact Sonic and shares its engine and transmission. then it adds optional all-wheel drive, which isn't available on the Sonic hatchback or sedan. And while it's been on sale in Mexico and Canada for a couple of years, the 2015 Trax entering the U.S. market gets several new features plus a structural upgrade to handle tougher new crash-safety tests. With added sound insulation, the U.S. Trax may be one of the more quieter small utilities on the road, and conceivably more refined than simpler Trax versions sold in more than 60 other countries. You could consider the 2015 Trax a tall five-door hatchback, or a classic two-box utility vehicle in miniature. It's about 169 inches long, with a 101-inch wheelbase and 61-inch-wide track, which gives it the footprint of a subcompact by today’s standards. It is, at 66 inches tall, quite a bit higher than a typical subcompact hatch. An arched-back roofline and nicely sculpted flanks do their best to keep it from feeling too slab-sided, fronted by a taller, stubbier version of the current Chevrolet corporate grille that blends into a high hood line. Rubber-look lower-body components to offer a hint of ruggedness—although, of course, the Trax isn’t meant for the trail. Inside, the Trax gets an instrument panel look that has a lot in common with the Sonic's motorcycle-influenced layout, including a sweeping tachometer, a digital speedo, and otherwise, a simple, sporty, upright look to the dash and trim. All U.S. Trax models come powered by a 1.4-liter turbocharged four-cylinder engine, making 138 horsepower and 148 pound-feet of torque—with peak torque from just 1,850 rpm on up. It’s paired to a six-speed automatic transmission with a wide range of gear ratios, allowing relatively quick takeoffs but a deep overdrive sixth gear for relaxed, fuel-efficient highway cruising. Fuel economy ratings are 29 mpg combined for the front-wheel-drive version, dropping to 27 mpg if you add all-wheel drive. The Trax’s underpinnings are much like those of many typical small cars and carlike crossovers, with a MacPherson strut front suspension and a torsion-beam rear setup with tubular V-shaped beam and twin-tube gas shocks. Column-mounted electric-boost power steering provides maneuverability and responsiveness, and all models will include four-wheel disc brakes (ventilated in front). 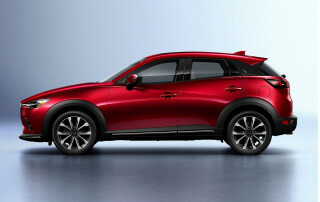 This small crossover—or tall hatchback, more appropriately—fits four adults, or five in emergencies if the three in back are quite small. Rear seats are split 60/40 and fold forward flat, while there’s storage in all four doors as well as various cubbies. Cargo space expands from 18.7 cubic feet with the rear seatbacks up, to 48.4 cubic feet with them folded forward. The front passenger seat can fold flat for long items, too. A rearview camera system is standard, as well as an electronic stability control system with rollover mitigation, electronic brake force distribution, and Brake Assist. And the Trax offers an astonishing 10 standard airbags. 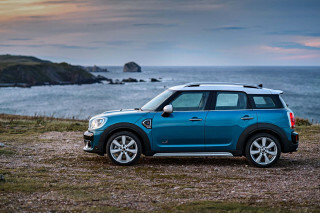 Both the driver and front passenger get standard knee bags; front and rear outboard positions get side thorax airbags; and side curtain bags cover those in front and rear outboard positions. The 2015 Chevrolet Trax starts at $21,000 for a base front-wheel-drive LS model. There are three trim levels--LS, LT, and LTZ--with keyless entry included across the model line. LS models come with 1990s-style 16-inch steel wheels and silver plastic wheel covers, while LT models get 16-inch alloy wheels and top LTZ models get 18-inch alloys. The LT model will likely be the top seller, and it adds roof rails, heated power adjustable mirrors, and a handful of other features. Buyers can mix and match features that appeal most to them within the LT model designation; the list is long. The top-of-the-line LTZ includes standard feature like heated leatherette seats, an auto-dimming rear-view mirror, and a Bose seven-speaker sound system. A sunroof is optional. The Trax offers next-generation OnStar telematics services and MyLink connectivity, including an available 7-inch color touch-screen system with additional USB ports, SiriusXM satellite radio services. That system is compatible with expanded Siri Eyes Free connectivity for iPhone models, and with the BringGo navigation app, which essentially allows smartphone users with the installed app to project maps and directions to the vehicle’s display screen. Chevrolet’s new OnStar 4G LTE embedded vehicle data system is also offered in the Trax, potentially turning the vehicle into a Wi-Fi hotspot when needed. The 2016 Chevy Trax is a tall hatchback with Chevy truck cues that only serve to create a generic look. The 2015 Chevrolet Trax is the second vehicle offering all-wheel drive to be built on the underpinnings of Chevy's Sonic subcompact. While it shares only its front doors with the Buick Encore that's the same size, its styling is far less expressive than the littlest Buick's. The designers have added some Chevy truck styling cues to what's essentially a tall, two-box small hatchback body. The slightly squarer lines work better than the Buick's swoops and flourishes, to our eyes, but the Trax has few of the complex angles found on the larger and very handsome Impala full-size sedan--perhaps underscoring the truck/utility aspirations of this five-door subcompact. The result is entirely inoffensive exterior lines that are bland enough to approach the generic. We didn't see a single head turn during several hours of driving the Trax. In other words, Chevy's chosen to play it very safe against the much more overt design cues of competitors like the MINI Countryman or Nissan Juke. It's not a bad shape, it's just an anonymous one. Base LS models ride on steel wheels with silver plastic wheel covers, something of a throwback, but only a missing chrome beltline strip and black door-mirror pedestals underscore the budget nature of the lowest trim level. 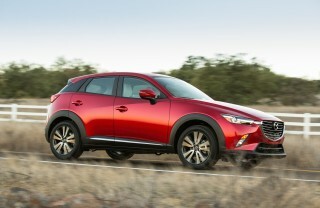 It also forgoes the roof rails standard on all other models, giving it a cleaner look in our eyes. The mirrors themselves, the rear license-plate housing, and other smaller pieces remain body color, in keeping with Chevy's desire to emphasize value for money even on base models. Alloy wheels are standard on the mid-level LT model--at 16 inches--and the top-of-the-line LTZ model, at 18 inches. Inside, the Trax adapts the "twin cockpit" Chevy styling theme to a more practical, utilitarian, and upright configuration. The instrument cluster is almost identical to that of the Sonic, with a tachometer at the left paired with a 3.5-inch monochrome display screen holding a numeric speedometer and various bar gauges and warning lights. The base black-cloth upholstery has not only a pattern of light oblong shapes on it, but contrasting blue stitching--a nice touch that relieves the potential grimness of all-black upholstery and furnishings set off by just a couple of silver trim accents. Higher-line LTZ models come with nicer vinyl upholstery in a two-tone--ours was chocolate brown and black--and add some patterned trim embellishers over parts of the console to relieve the black. Overall, the Trax design is straightforward, practical, and probably suited to its size and likely usage. We just wish the designers had taken a few more risks; when your vehicle looks generic right out of the box, it may be destined for invisibility on the roads--even if you end up selling a lot of them. There's not a lot of upper-end power in the 2015 Chevy Trax, though it's fine around town; handling is good, if unremarkable. The 2015 Chevrolet Trax comes with only a single powertrain, unlike the front-wheel-drive Sonic hatchback and sedan on which it's based. The turbocharged 1.4-liter four-cylinder engine produces 138 horsepower and 148 lb-ft of torque, and it's mated to a six-speed automatic transmission. Front-wheel drive is standard, and to Chevy's credit, all-wheel drive is a $1,500 option across all three trim levels--unlike some makers who only offer AWD on pricier models. Chevrolet is proud of the fact that its engine puts out maximum torque from as low as 1,850 rpm up through 4,900 rpm. The Trax performs well around town, with good acceleration up to about 50 mph, though the extra 300 pounds of the AWD version make it slightly slower to gather speed. The company quotes 0-to-60-mph acceleration times of 9.4 seconds for the front-drive model and 9.7 seconds for AWD, which isn't fast but is roughly on par with a number of subcompact and compact cars. But the Trax starts to run out of steam as you approach highway speeds, and the usually quiet engine gets relatively much noisier above 3500 rpm. And for all that sound it produces from 3500 to its redline of 6500 rpm, it just doesn't gather speed all that quickly. Quick spurts from, say, 60 to 75 mph on the highway take pre-planning, and you'll hear the effort the engine makes. Part of that is due to gearing that maximizes around-town fuel economy, and it's also a credit to Chevy's sound engineers that they've managed to make low-speed operation so quiet. Handling and roadholding of the Chevy Trax is about average for small utility vehicles. It's nowhere near as much fun to drive as a larger Mazda or even Ford compact crossover, but it feels solid on the road and absorbs bumps fairly well. The electric power steering has been retuned for better on-center tracking on the highway, and a slightly heavier feel at parking-lot speeds. In our maneuvers, we think Chevy's calibration engineers did well: There's enough feedback when you need it, and the weighting felt right at pretty much any speed. 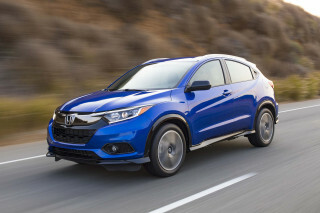 The AWD Trax rides slightly higher than the front-wheel-drive version, which is not only lower to the ground but has a deeper front air dam--both features that help with its 2-mpg gain on combined average fuel economy. For trivia buffs, the Trax AWD is a "light-duty truck" in the eyes of the Feds, while the front-drive model is a passenger car. It's all in the interest of maximizing fuel economy. 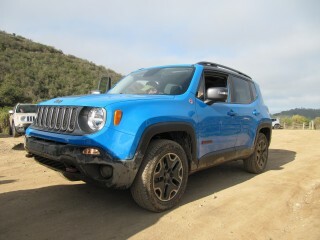 We didn't feel a great deal of difference--the increase in ride height is only about half an inch--but the AWD model felt slightly heavier and a touch slower. Given the higher seating position in a small and short vehicle, the Trax did demonstrate some body roll, though its relatively wide track prevented it from feeling "tippy" like utility vehicles of prior decades. The optional all-wheel-drive system starts out powering all four wheels at low speeds, and then gradually dials back power to the rear wheels from there to 37 mph. Above that speed, the Trax is powered solely by its front wheels, unless the traction control system senses wheel slip, in which case it splits power among the four wheels as needed to maintain forward motion. We didn't get a chance to test the capabilities of the AWD system on our largely urban test route, but hope to do so when we have the Trax for a longer drive report. The 2015 Chevy Trax is commendably quiet under most circumstances and rides decently, but it gets noisy under heavy acceleration. The 2015 Chevrolet Trax has benefited from a great deal of work by Chevy engineers to reduce road and wind noise, and it's worked. For a small utility vehicle starting at $21,000, the Trax cabin is remarkably quiet under most types of use. At idle, the engine essentially can't be heard, aided by a transmission that shifts imperceptibly into neutral until the car moves away, to reduce vibrations through the drivetrain and steering. Around town, as long as you're not pushing it too hard, the 2015 Trax is pleasantly hushed, with the loudest sound being the tires on rougher pavement surfaces. But if you need to drive it hard, the engine starts to make a lot more noise--somewhere between a howl and a roar--and you'll suddenly be conscious of how hard you've asked it to work. In some ways, it's the downside to the quiet operation while driving around town; passengers are simply more conscious of engine noise when it appears. The front seats are comfortable, with lower cushions long enough for most taller drivers (a frequent failing of the smallest cars from some makers). The driver's seat is manually adjustable for height as well as rake. Top-trim models get power adjustment for the forward-aft movement and height, although the backrest angle remains manually adjustable (via a very, very short lever that unfamiliar passengers will have to search diligently to find). The steering wheel both tilts and telescopes. There's plenty of headroom front and rear inside the Trax and it feels like a much larger vehicle from the inside than it appears on the exterior. The sole tipoff to its size is that front-seat passengers' shoulders are only 3 or 4 inches apart, and the driver's seat has a fold-down armrest. The passenger seat doesn't have the armrest, and there's no console compartment with a padded top either. Instead, there are four cupholders set lengthwise behind the shift lever (four! ), with the rearmost one accessible to rear-seat riders as well. The Trax boasts 15 interior storage cubbies, trays, bins, and cupholders, including upper and lower gloveboxes, upper and lower bins in each door and the center console, and one of our favorite features: smartphone-sized vertical slots with rubber bottom liners each side of the center-console ventilation outlets. Build quality of the pre-production Trax models we drove was good, with no buzzes, squeaks, or rattles apparent. While most of the black interior panels are hard plastic, there are soft-touch surfaces for areas like armrests--and the overall effect is utilitarian and practical, with more than a hint of Chevy truck showing through. The 2015 Chevy Trax gets best-in-class ratings -- although it's missing any sort of active-safety possibilities. One of the reasons that the U.S. is only now getting the 2015 Chevrolet Trax, despite its being on sale in Canada for two years, was updates the made for this model year to improve the little utility vehicle's safety. The Trax has already managed both top five-star results from the National Highway Traffic Safety Administration (NHTSA) and the Insurance Institute for Highway Safety (IIHS), and with all 'good' ratings (including for small overlap frontal impact), it's been named a Top Safety Pick by the IIHS. It's not eligible for the new Top Safety Pick+ award, though, due to its lack of forward-collision warning and other advanced electronic safety systems required to achieve that designation. The 2015 Trax has no fewer than 10 airbags as standard equipment, including not only the usual front and side bags for driver and front-seat passenger, plus side-curtain bags, but also knee bags for both front passengers and even rear thorax bags mounted outboard of the rear seatback that protect rear-seat riders' ribcages in the event of a side impact. A rear-view camera is also standard equipment on the Trax, as are rear-seat headrests that can be lowered enough that they don't block rear vision at all--a feature we wish more small-car makers would adopt. The little Chevrolet utility vehicle also has all of the usual suite of safety systems, including anti-lock brakes, traction control, stability control, tire-pressure warning, and more. The 2015 Chevy Trax includes a number of standard features, including a 7-inch touchscreen and a backup camera, that cost extra on pricier vehicles. The 2015 Chevrolet Trax is offered in three trim levels, with a starting price of $20,995 including the mandatory delivery fee. All-wheel drive is a $1,500 option on all three trim levels, to Chevy's credit, and not restricted only to pricier models. The base AWD Trax, at $22,500, is by far the least expensive all-wheel-drive Chevrolet model, with the Equinox compact utility being several thousand dollars more. The base LS trim level, which will account for perhaps 20 percent of Trax models, Chevy says, comes standard with a number of features that are optional on competing vehicles. 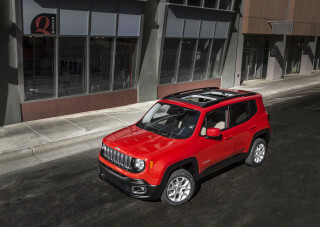 Keyless entry; 10 airbags; a rearview camera; air conditioning; power windows, locks, and mirrors; 4G LTE connectivity with built-in WiFi hotspot; Onstar capability; and MyLink entertainment system with standard 7-inch color touchscreen display are all standard on every Trax. The LS model comes with 16-inch steel wheels and silver plastic wheel covers, and a handful of exterior items show its base trim designation. There's no chrome strip below the window line, and the pedestals for the door mirrors are black rather than body color, and there are no roof rails. Still, the Trax is well equipped as a base vehicle compared to pricier entries like the MINI Countryman and the Subaru XV Crosstrek (which is one size larger, in the compact segment). 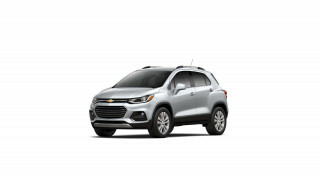 The mid-level LT model, which Chevy says will provide up to 60 percent of Trax sales, adds standard 16-inch alloy wheels, roof rails, heated power adjustable mirrors, and a handful of other features. The option list for the LT is long, letting buyers mix and match among the features that appeal most to them. The top-of-the-line model is the LTZ, which includes many of the options offered on the LT, including the 18-inch aluminum wheels, heated front seats with leatherette trim, a Bose seven-speaker sound system, fog lamps, six-way power driver's seat adjustment (backrest angle is still manual), a leather-wrapped steering wheel, rear park assist (a proximity beeper), and an auto-dimming rearview mirror. The only other option is a power sliding sunroof, available on the LT and LTZ. 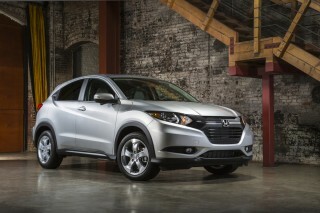 A top-of-the-line Trax will be around $30,000. The 2015 Chevy Trax gets good gas-mileage ratings--up to 29 mpg combined--for a utility vehicle, even a small one. The 2015 Chevrolet Trax has one of the higher fuel-economy ratings among all-wheel drive vehicles, although it's lower than three different models based on the Subaru Impreza hatchback. At 27 mpg combined (24 mpg city, 31 mpg highway) for the AWD version, it bests the all-wheel-drive Buick Encore built on the same underpinnings by 1 mpg--and it's exactly equal to versions of the MINI Countryman and the Nissan Juke fitted with all-wheel drive and automatic transmissions. Those three Subaru models--the XV Crosstrek at 29 mpg, and the XV Crosstrek Hybrid and standard Impreza hatchback at 31 mpg--do better, however. The front-wheel-drive model of the Chevy Trax is slightly higher, at 29 mpg combined (26 mpg city, 34 mpg highway). If you sacrifice the AWD, however, there are many more subcompact hatchbacks with higher fuel economy--up to the Toyota Prius C hybrid, at a combined 50 mpg. Again, the Trax is 1 mpg higher than the comparable model of the FWD Buick Encore. Great smartphone interface, outstanding stereo sound, and very comfortable drivers seat. I have only owned by Trax LTZ for a week now and I must say I really enjoy driving it. I traded in my 2014 Subaru Crosstrek XV because the driver seat had no lumbar support and my back started to bother me... I have only owned by Trax LTZ for a week now and I must say I really enjoy driving it. I traded in my 2014 Subaru Crosstrek XV because the driver seat had no lumbar support and my back started to bother me. The Chevy Trax LTZ has an adjustable lumbar support which is very comfortable for me. The smartphone interface is much better than the Crosstrek as I was able to import all my contacts and for a small fee can download the briggo app for vavigation. Also the stereo on the trax blows away the stereo on my crosstrek. The trax IS peppy you just have to hammer down on the gas peddle. Fun to drive. Great gas mileage. Safe, awd does everything you want it to do. Rides great for it's size and feels much bigger on the inside then it looks. Looks good too! Leased the car in May,and so far we love it. Excellent. 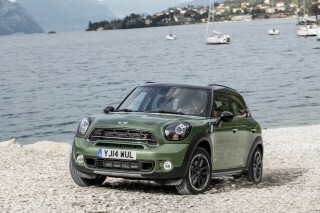 Our model has the 1.4 litre turbo. Has a lot more get up and go then our last car. Lot more room also, and smoother ride.Better gas mileage also. Very nice vehicle with great features and electronics. The trax seems larger than it is. Very easy to drive and park in the city. The wifi is great and onstar makes that even better. Very comfortable and easy to get in and out. Backup camera makes parking in tight... The trax seems larger than it is. Very easy to drive and park in the city. The wifi is great and onstar makes that even better. Good size & Great price. Fits good 4 a big guy like the xm - back-up camera and fuel milage is good. Turning radius great - priced right. Looking for a different year of the Chevrolet Trax?